Even though he was Mexica, but was ruler of Texcoco. He was an ally of the Mexica. One of the great poets of Mexico. Son of Nezahualcoyotl. Ruled Texcoco. Did his best not to get Texcoco not to become part of the Mexica Nation. Was half-brother to Moctezuma Ilhuicamina. Born in 1398 and considered to be a power behind the throne of three Mexica rulers and an active co-leader of the government. Although this power broker was never the "official" ruler, he was close enough. Was offered the throne but declined. Respected war general. Titled Cihuacoatl (Nahuatl for Snake Woman. A rank in power.) and Tlacochcalcatl (Spear House Chief. Another rank in power.). Also acted as chief judge. Nephew of Itzcoatl. Considered a brilliant psychopath. Tlacaelel set up a duel throne that sat next to Moctezuma Ilhuicamina (Was also known to wear the turquoise diadem that his brother the king, Moctezuma Ilhuicamina, wore and as his brother's reign progressed, Tlacaelel became as much a ruler as Moctezuma Ilhuicamina.). He was named Prince-of-the-armies and commanded the legions of the Triple alliance. Tlacaelel held power for sixty eight years as the power behind the king and is considered responsible for the creation of the "flower wars", and the subjugation of all to Huitzilopochtli. Rose to power behind his great military victory in 1429 as the hero of the Tepaneca war. Was called "Prince of the Armies" after the fall of Atzcapotzalco and defeat of the Tepaneca Empire that established the Mexica as the dominant force in the valley. Tlacaelel was rumored to have been behind the poisoning of Tizoc. His title of Cihuacoatl was in his capacity as minister of internal affairs and is considered to be the most famous to hold that title. Tlacaelel held many titles but none as great as his historical title of master of the destiny of the Mexica. Brother of Montezuma. Took power after the death of Montezuma. He was responsible for La Noche De La Victoria (It is known as La Noche Triste to the Spaniards). He raised the Mexica Flag (which can be seen on the main page of this site) that night. 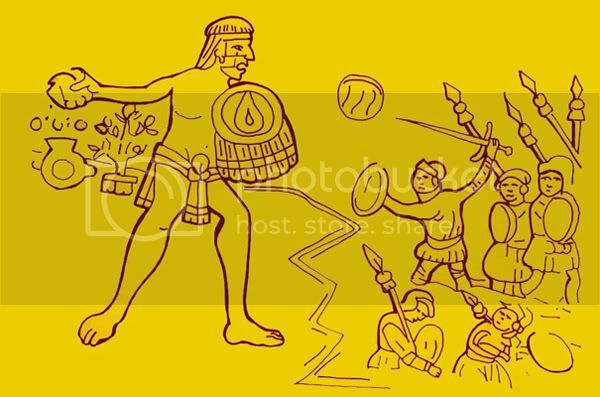 Sadly, most people see it as a Cuauhtemoc Accomplisment. Died from Small Pox. Captain who didn't give up in battle during the conquest. Mexica Warrior who was an Otomi rank in the Mexica military. He was the last Mexica in Tenochtitlan when everybody went to Tlatelolco. He wore many disguises because the spaniards wanted to kill him so badly. They did their best to try to kill him or cripple him. The Spaniards and their native allies "shook with terror at the mere sight of him". He was one of the three captains who didn't retreat at the battle of Nonohualco. Pic of him fighting the spaniards single handedly from Codex Florentine. Nahuatl for the Left-Handed One. He was a lord who was captured with Cuauhtemoc.